John Stuart Mill was a British political economist, philosopher, and a civil worker. He is often referred to as the 19th century’s most influential English-speaking philosopher. He was also a proponent of an ethical theory, Utilitarianism, developed by Jeremy Bentham. 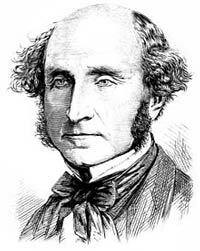 John Stuart Mill was born in May of 1806 in Pentonville, London. His father was James Mill, an economist, philosopher, and historian. His mother was Harriet Barrow. He started his education at home with his father and at the age of three, he started learning Greek. At eight years old, he began learning algebra and Latin. He was also acquainted with the works of Aristotle, Euclid, Plato, Jeremy Bentham, Herodotus, Adam Smith, David Ricardo, and Thomas Hobbes, among others. From 1820 to 1821, Mill was sent to France with the family of Sir Samuel Bentham, an English Utilitarian professor, theoretical jurist, and economist. There, he gained a thorough knowledge of the French language. At the age of 17, Mill became a member of the Utilitarian society and started to write articles in the Westminster Review. In 1826, Mill suffered a serious mental breakdown. He believed that it occurred because of how he suppressed his natural childhood tendencies earlier in life so he could excel academically. As a result of his mental health, Mill decided not to attend a university but rather pursue a career in business. His economic and historical intelligence helped earn him an honorary membership in the American Academy of Arts and Science. Later, Mill served a seat in the parliament in Westminster and served as Lord Rector at the University of St. Andrews. It was during this civil service that Mill actively engaged in women’s rights campaigns to give the women the right to vote. Mill’s contribution to philosophy is enormous. As a philosopher, he was a radical empiricist who said that all human knowledge, inclusive of logic and mathematics, is derived from generalization and sensory experience. His philosophy was a modified version of Utilitarian theory, which his father and Bentham taught him. Mill wrote a number of books on politics and philosophy, which includes A System of Logic in 1843, Principles of Political Economy in 1848, On Liberty in 1859, and Considerations on Representative Government and Utilitarianism, both of which were published in 1861. Mill published several other works on politics and ethics, in addition to environment, welfare, and justice. Although he was more influenced by Utilitarianism, he also worked again and again in defense of the importance of the rights of individuals, including women’s rights to education and suffrage for women. John Stuart Mill became a close friend with Harriet Taylor in 1832. They married in 1851, after 21 years of intellectual friendship. She influenced his works and ideologies. Taylor died in 1858 and Mill died 15 years later in 1673 in Avignon.